Another four people slain and several wounded yesterday as someone with a weapon exercised his right to display his disapproval of something. Looks like the NRA won't back down in any shape or form with its solution of armed guards as above and the registering of every person with mental illness. That won't solve anything as anyone can still get access to guns even though they might not own them and so-called sane people shoot spontaneously if the weapon is readily available. Has a bigger pack of rednecks than the NRA ever drawn breath? FMD. There also seems to be a massive overlap of NRAists and those who think it's better to cut social security and health care rather than increase taxes on those earning over $1m pa.
Obama used a seemingly new term today - rather than the politically charged "gun control" he talked about "gun safety". Is that like renaming a speed camera a "safety camera"? I wish Obama well in his attempts to at least put tighter controls on assault weapons, but I fear the rednecks will prevail. skully wrote: Has a bigger pack of rednecks than the NRA ever drawn breath? FMD. [snigger] Says the white-shoe-wearing Pinko assault-rifle-packing Banjo. 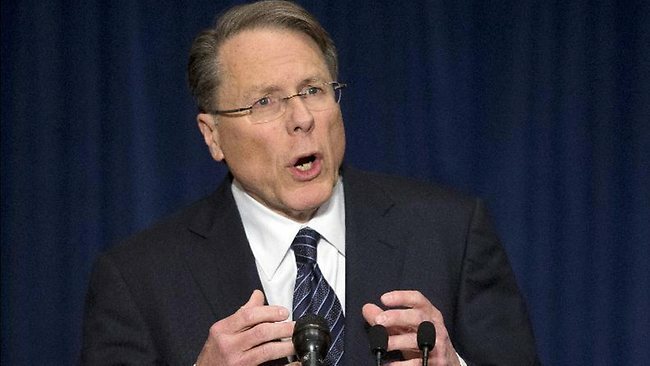 ...NRA speech has been widely ridiculed in the media, but unfortch 4 million NRA members think just like him. Another qunt in the US kills firemen. The NRA will be coming out and saying every Fireman should be escorted by 2 armed policemen. "Great Britain has long been held as the shining example of what can be accomplished via gun control. Handgun ownership is all but unheard of and rifles and shotguns are tightly controlled and citizens require a "good reason" to be issued a permit to own one. Historically, self-defense has not been considered a good enough reason. Now, the Daily Mail reports that while law abiding citizens have been nearly universally disarmed, the criminals have not and flaunt their power. According to the Mail, "the level of violent crime in Britain has risen by 70 per cent. Gun crime is up by more than half and there are more than 100 serious knife crimes each day, with fatal stabbings having reached the highest level on record." There are many explanations offered for the rise in crime, family breakdown, devaluing of marriage, welfare as a way of life, increasing unemployment, increasing drug use, and the rise in power of street gangs. Despite this blunt portrayal, they failed to note one important thing... that DISARMED CITIZENS ARE AT THE MERCY OF THE CRIMINAL ELEMENT." They say that "carrying weapons is becoming the norm," but not by the law abiding. Only the criminals have the weapons because the government gave everyone a choice: be a disarmed victim living your life at the mercy of the lawless or become lawless yourself. Sadly, they now must reap what they sowed. Wonder what'd have happened if all the rioters last year had guns and semi automatics. Is this correct? And since when? That Daily mail article was in 2009, and the figures claimed by the then shadow home secretary. Doesn't explicitly state there in comparison to what. Only says drug abuse has gone up in the past five years. Gone up 70% to reach around 0.55% of what happens in the USA. Please, please do not take anything seriously that first appeared in the Daily Mail. ‘‘Are the President’s kids more important than yours?’’ the ad asks. ‘‘Then why is he sceptical about putting armed security in our schools when his kids are protected by armed guards at their school? A group of nutters in the US are actually claiming that the Sandy Hook school shootings were some kind of White House conspiracy to gain public support for stricter gun controls, and that the grieving parents were crisis actors. Now, there are mutters everywhere who have sick and twisted views like this. The US seems to have more than its fair share. But the scary thing about this group of nutters is that the chief conspiracist is a college lecturer. Sometimes I think about America and start to feel genuinely scared. skully wrote: [snigger] Says the white-shoe-wearing Pinko assault-rifle-packing Banjo. People like this guy are scared. They need SOMETHING to compensate for inferior sized genitalia. Henry wrote: A group of nutters in the US are actually claiming that the Sandy Hook school shootings were some kind of White House conspiracy to gain public support for stricter gun controls, and that the grieving parents were crisis actors. It's an improvement from claiming the September eleventh attacks were a govt conspiracy. How do such arseclowns even get coverage? I forget the numbers but a statistically significant portion of local goverment areas in the US have a maority belief that the world was created in 7 days. No kidding! The US teenager accused of fatally shooting his parents and three younger siblings told authorities he was annoyed with his mother and had been having homicidal and suicidal thoughts, according to a probable cause statement. Nehemiah Griego, 15, remained in custody on Monday on charges of murder and child abuse resulting in death. Griego told the detective that his brother did not believe him that their mother was dead so he showed his mother's bloody face to his brother and then shot him, according to the statement. He was arrested following the shootings Saturday at a home in a rural area south-west of Albuquerque, New Mexico, where he lived with his family. A Bernalillo County sheriff's detective questioned the teen on Saturday night and the details of their conversation were spelled out in the statement. The teen allegedly told the detective that he took a .22 calibre rifle from his parents' closet about midnight on Saturday and shot his mother in the head while his younger brother slept next to her. He's accused of then shooting his two young sisters in their room. He retrieved an AR-15 rifle from his parents' closet and waited in a downstairs bathroom for his father to come home. The statement said he shot his father multiple times after he passed the bathroom doorway. The teen said he reloaded the guns so "he could drive to a populated area to murder more people", according to the statement. His plan, the statement said, was to "shoot people at random and eventually be killed while exchanging gunfire with law enforcement". Sheriff's spokesman Deputy Aaron Williamson said on Monday he couldn't immediately comment on the document. Detectives have spent two days collecting evidence and trying to piece together what led to the violence. "There's no other way to say it, except that we have a horrific crime scene down there that we are working on," Bernalillo County Sheriff Dan Houston said on Sunday. The detectives had finished their work at the home by Monday afternoon. The metal gate at the home's entrance was shut, a small bouquet of purple flowers was on the top of the gate and at each side there were religious signs, including one that read "Jesus is the reason for the season". The sheriff's office identified the victims as Greg Griego, 51, his wife Sarah Griego, 40, and three of their children: a nine-year-old boy, Zephania Griego, and daughters Jael Griego, 5, and Angelina Griego, 2. All appeared to have gunshot wounds to the head. Greg Griego was a pastor who had once served at Calvary, one of Albuquerque's largest Christian churches. He was also well-known throughout the law enforcement community for his work as a voluntary chaplain. Neighbour Terry Wootan described Griego as a man with a big heart. The two sometimes chatted at the mailbox and would wave to each other when passing by. Wootan said Griego told him about his time in California when he was involved in gangs and how he turned his life around and found God. "What he wanted to do was help people, and he would never quit," Wootan said. The pastor's death has shocked the community, including the Albuquerque Fire Department and the Metropolitan Detention Centre, where he volunteered his spiritual guidance. A records check by the Children, Youth and Families Department indicated no trouble with the Griego family and that Nehemiah Griego had never been in trouble with the law. "This youth had no history with the juvenile justice system," agency spokesman Bob Tafoya said on Monday. Williamson confirmed there was no history of any emergency calls to the home in the recent past. Neighbours said they saw the first police cars and ambulances arrive at the home on Saturday night. The road was blocked and word of the shootings began to make its way through the neighbourhood. According to the probable cause statement, Nehemiah Griego first told a staff member at Calvary that his family was dead and that he placed the two rifles in the family van as protection before driving to the church. He later changed his story, according to the detective's statement. Asked if he had told anyone else about murdering his family, Griego allegedly told the detective that he had taken a picture of his dead mother and sent it to his girlfriend. Sheriff Dan Houston plans to hold a news conference on Tuesday morning, and the teen could make his first court appearance in the next day or two. The NRA will be calling for armed guards in all bedrooms.